Home » Which is the right Binder to Secure Loads? Load binders are tools that are used to tighten chains while securing a load for over the road transportation or for cargo ship transportation. There are two different styles of chain binders that are used in the industry: Lever Binders and Ratchet Binders. Both are excellent tools for securing loads. A lever binder is a very simple tool that uses a Lever and Chain Grab Hooks to grab and tighten a chain. A lever binder uses a hinge and can reduce slack by pulling on one end of the tension hook and can lock after a 180-degree rotation. There are many advantages for using a lever binder. This variation allows for easy instillation, less moving parts, and a quick and secure release. 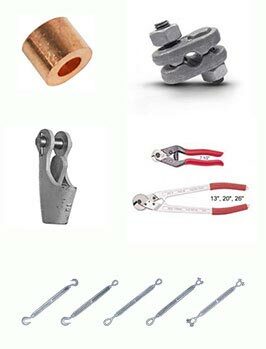 Ratchet binders use a back and forth ratchet motion in order to securely tighten a load. They tighten slowly, but they are easy to operate. This helps to greatly reduce strain on the body. A lever-type is more difficult to use. It is common to find these types of binders in operations that are moving heavy equipment over the road. Using a ratchet binder also makes for safer release. If you are interested in learning more about binders, rigging supplies, or crane wire rope, contact us today!